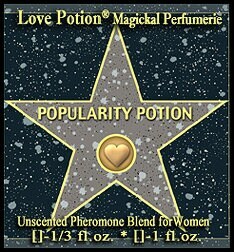 POPULARITY POTION - UNscented Pheromone Blend for Women. The purpose of Popularity Potion is to help give off an air of 'movie star-esque' charisma. Can assist one in becoming the center of attention, and in elevating the mood of those around you, making you the life of the party. Specially tempered to reduce feelings of jealousy and envy from others that can arise when YOU are in the spotlight. Total of 1,000 mcg per bottle. Ingredients: alpha-androstenol, androstanone, estratetraenol, THDOC, 17-phenyl-androstenol, epiandrosterone sulfate.